Counterfeit was Martin L. Gore‘s first solo release outside of Depeche Mode. A collection of six covers ranging from The Durutti Column to Sparks, Gore’s voice is here allowed to shine through rather than being relegated to backing vocals or only appearing on the more poignant ballads of the Depeche back catalogue that were less suited to nominal frontman Dave Gahan‘s vocal style. Counterfeit was produced by Gore and Rhythm King stalwart Rico Conning, and released by Mute in 1989 while Depeche Mode were on downtime between the Music For The Masses and Violator albums. Never a band to go for cover versions (off the top of my head I can only count three, including one Beethoven piece), hearing Gore delivering other people’s songs is something of a rare, and absorbing, proposition. Opening with a cover of Joe Crow’s ‘Compulsion’, things start off in relatively upbeat territory. Sometime Nightingales member Crow’s solitary and pretty obscure Cherry Red 7″ is here delivered as an affirming, strident track, all upbeat pianos, pulsing percussion and melodica-style synths. I used to listen to this occasionally after disappointing events took place (usually getting dumped by a girl), the ‘got to move on sometime’ refrain and the gentle piano somehow allowing me to transcend whatever I was feeling miserable about. Nearly twenty years on from when I first bought this, it still never fails to work. ‘In A Manner Of Speaking’ was originally recorded by Tuxedomoon and appeared on their Holy Wars LP. 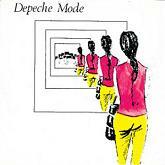 Gore’s version includes a vaguely Latin rhythm in the style of Depeche Mode’s ‘To Have And To Hold’ from Music For The Masses, underpinned by a dark synth bass pulse. ‘In A Manner Of Speaking’ is filled with a theatrical drama, and to add to the mood Gore speaks his way through the final section, its elliptical lyric about telling someone everything by saying nothing making a level of sense on an emotional level. The cover of Factory Records’ stalwart Vini Reilly’s ‘Smile In The Crowd’ again opts for a Latin-style arrangement, a thin, pondering guitar line running throughout most of the track. This cover of the Durutti Column song is perhaps the closest Counterfeit comes to the bleak, inward-looking balladry that Gore’s own performances on record tend to lean toward. Meanwhile ‘Gone’, originally delivered by The Comsat Angels, has a cloying urgency, mining the same vibe of danger and helplessness that powered ‘A Question Of Time’, riding forth on a pulsing beat marked by thick bass notes and industrial tension. Gore’s cover of Sparks’ ‘Never Turn Your Back On Mother Earth’ finds Gore taking Ron Mael’s beguiling, simple ode to the planet we live on and maintaining that sense of grace over a fragile, gentle backdrop of acoustic guitar and shimmering percussion. Tempted to make this plaintive song a whole lot darker though you might have expected Gore to be, instead the sense of wonderment of the Sparks original is maintained, Gore even having a decent crack at Russell Mael’s falsetto, highlighting the lead Depeche Mode songwriter’s strong vocal range. Gore saves the darkness for his take on the traditional song ‘Motherless Child’, here cast as a edgy jazz number, the dark swing of Gore’s introspective vocal delivered like an unused track from Cabaret. Counterfeit is a relatively unassuming record, considering how big Depeche Mode had become by this point. Gore’s emotional outpourings have always been popular with fans (check out the deafening cheers after one of Gore’s solo performances in the middle of a Depeche Mode stadium show), and hearing his effortless ownership of these six songs is one of the genuine highlights of his body of vocal work. 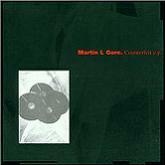 A follow-up to this EP would be released by Mute in 2003 containing more unexpected reworkings of other bands’ material. With a new Depeche Mode album and mega-tour just around the corner, and with fans evidently getting excited on social media sites like Twitter, it feels like an appropriate moment to write about Turner Prize-winning artist Jeremy Deller and director Nicholas Abrahams‘ film, Our Hobby Is Depeche Mode. The film, also known as The Posters Came From The Walls, was commissioned by Mute MD Daniel Miller and focusses its lens on the fans of the band, rather than acting as a strict biography of the group. When I first saw clips of Our Hobby Is Depeche Mode on the BBC documentary about Deller in 2012, I was prepared to think of the film as ridiculing devoted fans of the band; people I’ve spoken to over the past year or so, generally hard-core followers of the band, have all told me that the film is universally disliked by most fans as it casually mocks what for many people is a huge obsession. Whilst there are a couple of segments that feel a little too devoted, such as German couple Claudia and Ronny dressing their young son in home-made costumes from Depeche Mode videos like ‘Enjoy The Silence’ or Muscovites Ruslan, Marta, Margo and Elena delivering awful versions of DM songs complete with home-made videos, Our Hobby Is Depeche Mode is in reality a very sympathetic and sensitive portrait that shows just how much a band can influence, help and shape peoples’ lives. Throughout interviews with fans in St. Petersburg, Moscow, Bucharest, California, New York, Berlin, Iran and Canada, Depeche Mode emerge as a band that appealed to people who just didn’t fit in. Alex, a fan from Bucharest, explains that in the early Nineties the long-haired guys were into metal, the ugly guys were into folk, and the sensitive, clean-shaven, good-looking guys who wanted to know about the best clothes and fragrances were all into Depeche Mode; Orlando, a young fan from California dancing in the car park of the Pasadena Rose Bowl where the band played the 101 concert before he was even born, explains how Depeche Mode’s music helped him through the darkest days of his teenage years, saying ‘Martin Gore’s lyrics speak for me’; a Russian pirate TV performance sees a fan grabbing the microphone and stating that ‘it’s music for the lonely’; celebrity fan and self-confessed outsider nerd Trent Reznor says that for him Depeche Mode played ‘music for someone who felt like they didn’t fit in’; Andy, an Iranian fan now living in Canada explains that if you were caught listening to, or dressing like, Depeche Mode in Iran you would be beaten by authorities, and that for many in Iran Depeche Mode represented an outlet from an oppressive society. Even Marta, with her dreadful but heartfelt singing over Depeche Mode’s own songs, nails the message home when she says that the band’s music helped her to find her friends. If seeing obsessed Russian fans dressing like members of the band on ‘Dave Day’ – 9th May, Russia’s Military Day and Dave Gahan‘s birthday – seems a bit too much, English fans will probably never appreciate how important Depeche Mode’s music was to people whose democratic rights were managed entirely by the state. Albert, a hairy-backed melancholy chap with a huge tattoo of Gahan from his shoulders to his waist, explains that for many Russians, ‘this new music coincided with the fall of the Soviet Union so I see it as having been the music of freedom.’ For Alex, the well-groomed fan from Bucharest, Depeche Mode’s music was synonymous with freedom, with Violator arriving just three months after the bloody fall of Ceaucescu and becoming the music of a generation of young people whose cultural exposures had been dictated to them before. A trio of East Berliners speak about the seismic impact Depeche had in the East when they played the Free German Youth Concert in 1988. In contrast, Peter Burton from Basildon explains that even now Depeche Mode aren’t well known in the town they came from whilst offering a pretty colourless picture of the Essex new town back in the late Seventies. Taking the ‘back home they just don’t get it’ notion frequently attached to Depeche Mode one major step forward, the emphatic Francisca explains that Martin Gore‘s lyrics have a natural sense of tragedy and despair, something that she feels is central to Russian fans’ adoption of the band. She then goes on to brusquely tell the translator that English fans couldn’t understand or appreciate the lyrics in the same way as a Russian could. I perhaps don’t fully appreciate what she describes as the ‘transcendent nature’ of the Russian psyche, but I’ve read enough translations of Chekhov, Tolstoy and Solzhenitsyn in my time to see more or less where she’s coming from. One of the most powerful stories comes from Mark, filmed at Hammersmith Bridge, under which he would sleep as a homeless resident of London. Mark’s story perhaps punctures a large hole in Francisca’s logic about English fans – here is an individual who spent most of his homeless years listening to 101, scraping together enough cash to buy a ticket to see one of the band’s watershed concert at Crystal Palace on the Songs Of Faith And Devotion tour and drawing so much inspiration from the powerful feeling of togetherness that he experienced at the show to get himself off the streets. Two things aren’t featured in the film – first and foremost, the band themselves. They’re clearly a current that runs through the documentary, their music runs through the film throughout and their images are plain as day on posters, t-shirts, sketches and all manner of personal tributes in the bedrooms of the profiled fans, but there’s no interview footage here. Their absence makes the enthusiasm of the fans all the more powerful in many senses. The other thing that’s missing are the fans who collect each and every format of every record the band have released, from every country they’re released in. By focussing on the impact of Depeche’s live shows, it highlights the powerful way that concerts – or even fans dancing to concert footage in nightclubs – can bring people together, reminding me of something I once heard about fans being more interested in going to Depeche concerts to sing along rather than hear the band play. 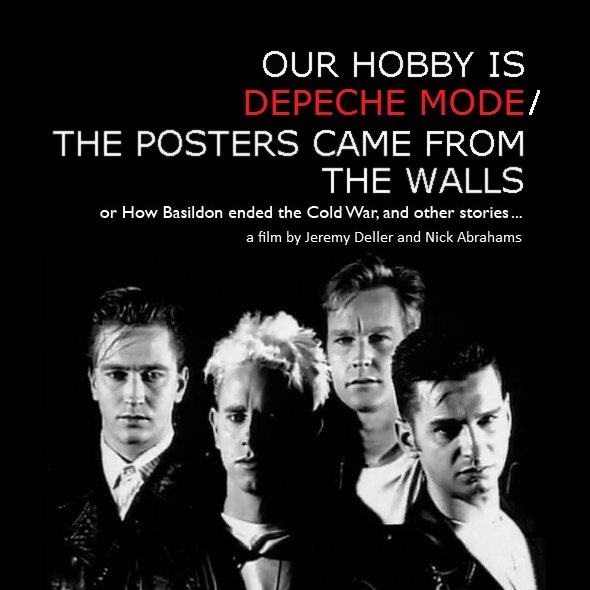 Our Hobby Is Depeche Mode has never been officially released, though it is screened occasionally. The precise reason why Mute have never issued it remains something of a mystery to Deller and Abrahams, though I have heard a rumour that despite the band liking it, there was some pressure behind the scenes to prevent it from being released. The pair even compiled a whole series of extra interviews with artists who were influenced by Depeche Mode, including techno pioneers Derrick May and Kevin Saunderson, the idea being that these would appear as bonus features on a DVD release. It remains a real shame, almost a tragedy of Russian proportions, that such a vivid and affectionate overview of what this band means to many people won’t get seen or appreciated by more fans, many of whom will find reflections of their own reasons for being attracted to the band mirrored in the stories here. 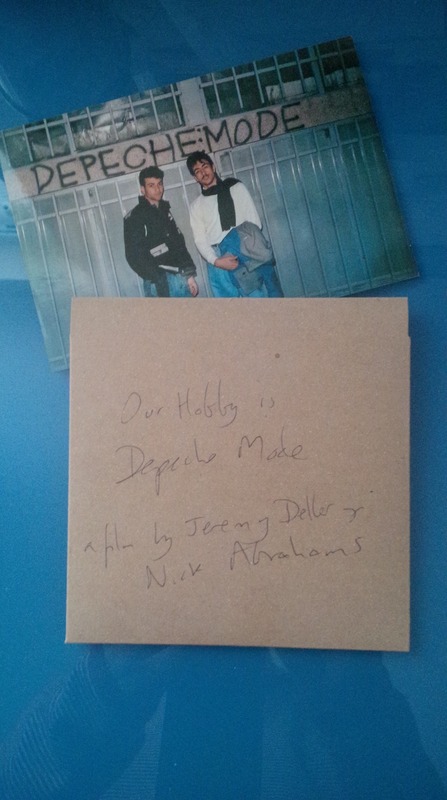 Thanks to Jeremy and Nick for the DVD copy of the film for this review. First published 2013; edited 2014. ‘Dreaming Of Me’ was Depeche Mode‘s first single, released by Mute Records in February 1981. Written by Vince Clarke and produced, like Speak & Spell, by the band and Daniel Miller, the track failed to dent the UK singles chart and was possibly a big disappointment for Miller, whose ambition had been to create a good-looking, radio-friendly electronic pop group. The single did, however, top the UK indie charts. ‘Dreaming Of Me’ is a simple, naive example of early electronic pop. Tinkly rhythms, thudding, bouncy drums and an aggressively phased bassline underpin a shouty, butch lead vocal by Dave Gahan that seems, like ‘Photographic’ from the Some Bizarre compilation album, to be concerned with introspection and cameras (very early Eighties). There’s a central melody on the middle eight which sounds like it was played on the same synth Miller used (as Silicon Teens) on his cover of ‘Red River Rock’, and the end section is all wordless vocal harmonies and spoken missives, almost as if the boys realised they needed a few more euphoric pop staples to make the grade. Unlike Miller’s previous works, either as producer of the likes of Missing Scientists or Fad Gadget, or with his own work as The Normal and Silicon Teens, ‘Dreaming Of Me’ has a clean sound and none of the rough edges associated with those other works. ‘Ice Machine’ signals that Depeche Mode always had a germ of darkness inside them. Imagine Metropolis’s dystopian landscape being transferred instead to the Ford plant in Dagenham and then imagine Kraftwerk providing the soundtrack; even that doesn’t come close to this almost industrial piece. There’s a stalking bassline and a fluttering, spiralling background melody that I’m sure Vince Clarke would go on to use again on Yazoo‘s Upstairs At Eric’s; clattering percussive sounds and whining, almost droning synths dominate the foreground. It is the sound of a brutal, grey production line but does seem to stretch out towards some sort of vague euphoria at the very end. Note that I’ve not included ‘Dreaming Of Me’ as a single from the debut Depeche Mode album, Speak & Spell, which was released much later in 1981, as it wasn’t actually included there (though it did appear on the US version instead of ‘Sometimes I Wish I Was Dead’). The 1988 CD reissue of the album tacked the track (and ‘Ice Machine’) on at the end. The version included there is a slightly different mix – much more sparse low end evident underneath the phasing and a non-faded ending. That ending finds the track collapsing in on itself; it’s the type of messing ending that the fade usually rubs out, all dud notes, missed beats and vocals suggesting they’d done enough work that day. Thanks to David McElroy for his help with this review.